Mood board: Julien Dossena also caught the Nineties nostalgia bug this season, opening his show with bustier baby doll dresses (some even tie-dyed), which were distressed by the house’s signature metal grommet – albeit in a grungier way than we’ve seen used before. Dossena’s spacey futurism vibe was still present in his track and field and terry-towelling swim sequences, but this season the whole package felt freer, certainly more deconstructed, and even experimental as he pushed further away from the house’s chain metal codes. Best in show: A black strapless dress towards the end of the show that was torn between exposing the unhinged secrets of its construction and Dossena’s otherwise clean oeuvre. 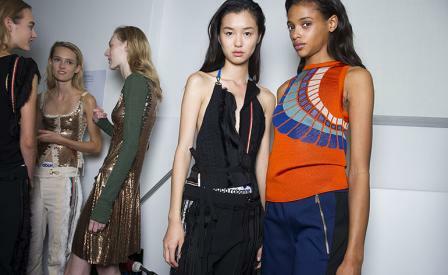 Finishing touches: Were they Paco Rabanne branded elastic underpants that we saw peaking above the pant line? The Nineties really are back, load and clear.